Bombs Bursting in Air is my fourth published work. My first three are self-published, and still managed to win some pretty cool awards. ; but since signing on with Headline Books, I have found a home full of encouraging words and sound advice. This YA title is inspired by the travesties caste upon US war veterans and is dedicated to my personal war hero, a VietNam vet. This is not about the veteran, though. This story is about the family he leaves behind. "If I had learned anything about life after Dad’s death, it was to expect the unexpected,” says Americka - aka Meri - in Bombs Bursting In Air by Lisa A. McCombs. When Meri went with her dad, a retired veteran, to see a war movie, she thought that she was being punished. Instead of continually hearing the loud bombs and explosions going off in the movie, Meri began to wonder why wasn't she spending time at the mall with her friends, Holly and Janie? A simple day at the theatre turned into a tragic occurrence when a terrorist opened fire. What saved Meri was her need to go to the restroom where she met her new friend, Fiona. As Meri travels through her journey to recover from her injuries, as well as the loss of her dad, Meri discovers that Fiona will become a pivotal part of her healing. Also, Fiona becomes the glue that helps Meri to not only heal, but bring an element that neither she nor her mother knew existed since her father's death. As I read Bombs Bursting In Air by Lisa A. McCombs, I became engrossed in not only the story, but in the realization that in a blink of an eye life can take a turn for the worst. As we step out of our door, drive in our car, or continue with our daily routine the unexpected can occur. There is nothing in life that says we will return from whence we came, and this is the case in Bombs Bursting In Air. Lisa A. McCombs brought it home in showing that in today's culture there is constant disruption and discord. These elements cause division and a high level of actions from terrorism and racism to other acts of violence. Bombs Bursting In Air by Lisa A. McCombs will stop and make you think about how these tragic occurrences have lasting effects, like Post Traumatic Stress Disorder (PTSD), on those that experience it, whether directly or indirectly. Bombs Bursting in Air is a Christian coming of age novel for young adults written by Lisa A. McCombs. Americka loved her dad, and she enjoyed doing things with him, but she just didn't share his taste in movies. Somehow, she had gotten persuaded to go to the movies with him that afternoon, and, of course, it was a war movie. You would think that three tours in the Middle East would have satisfied his interest in war, but that wasn't the case. He seemed to want to share his wartime experiences with his family by having them watching war movies with him, but Meri really didn't appreciate the chaos, blood and noise that accompanied those movies. She was starting to fidget as well from drinking her soda much too quickly. Her dad really wanted her to stay for the best part of the movie, but Meri couldn't wait another minute and rushed up the aisle to the restrooms in the lobby. As she bemoaned her pathetic life while taking care of business, she was surprised to hear a response from the nearby stall. Yes, there was a fellow sufferer escaping for a few moments from a movie they'd rather skip, but had attended for a loved one. Meri was surprised to find she had common ground with Fiona. She was older and wore the kind of makeup and hairdo one associated with goths or emo-kids. That said, they seemed to hit it off really well and found themselves giggling crazily at their messed up Saturday afternoon. As they both spent a minute or two reapplying lip gloss, which they noticed was the same brand and color, they suddenly heard the first and then two more succeeding explosions and the sounds of crying and screaming. Nothing would be the same again. Lisa A. McCombs' Christian coming of age novel for young adults, Bombs Bursting in Air, is a thoughtful and well-written story that addresses the impact of terrorism, both abroad and domestic, on young people. Many of them have parents who served terms as did Meri's father, and the incidences of domestic terrorism in this and other countries can instill danger and risk into even the most ordinary and innocuous activities such as attending a movie with your dad. McCombs' heroine, Meri, loses both her father and her ability to speak in that random matinee bombing, and seeing how she and her mother come to terms with their losses is inspiring. Meri's path towards healing also takes her into a most unusual and welcoming church; a place where faith and song seemed to mesh most gloriously for her. Bombs Bursting in Air discusses questions many young people may have about the motivations of those who seem to delight in destructive and random acts of terror and the impact it has on so many, and it does so in a positive and life-affirming matter. Bombs Bursting in Air is highly recommended. 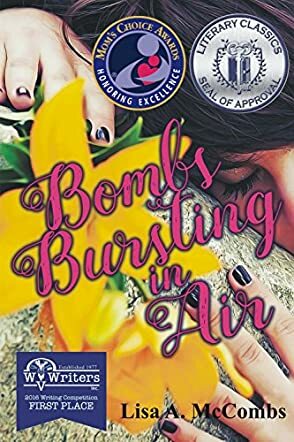 Bombs Bursting in Air by Lisa A. McCombs is the powerful story of a teenage girl named Americka Miller whose life is irrevocably changed when three bombs go off in the movie theater. She wakes up in the hospital to find her voice gone and her father having been killed by the blast. She finds comfort in a college student named Fiona whom she had met moments before the bombs went off in the movie theater’s bathroom. While the two girls had initially commiserated over being unwillingly dragged to the movies by their respective family members, after the bombing the two grow close. Fiona becomes a sort of role model for Americka, continuously visiting her, using American Sign Language so the two can communicate, and inviting her to church and supporting her newfound interest in religion. Fiona is initially presented as the foil to Americka, someone who is bubbly and confident in the aftermath of disaster, but as time progresses, we see that the two are much more alike than they realize. Throughout the story, the two girls draw strength from one another, learning to relive their lives after such a terrible incident. Bombs Bursting in Air by Lisa A. McCombs is a heartwarming story of tragedy and loss and the ensuing road to recovery. The story is told from Americka’s point of view, which allows for a deeper understanding of her character, especially because her Selective Mutism means that portions of her speech are merely internal monologue. It is this internal monologue, combined with her dreams and memories, that draws you into the story and helps you to understand the bond between Americka and her father, and the powerful impact that the loss can have on a person. With the help of her family, friends, and her newfound faith, Americka follows the road to recovery and learns that sometimes the best way to help yourself is to start by helping others. Americka (Meri for short) can't figure out why she agreed to go to another boring, gory war movie with her dad. She skips out to go to the bathroom, where she meets a mysterious and adult-seeming girl who is bailing on a sappy rom-com. Together the ditchers bond over their champagne lip gloss, oblivious about how their worlds are about to be turned upside down. Bombs Bursting In Air by Lisa A. McCombs is a story about a young girl growing up and healing from a devastating loss. After the disaster strikes, Meri begins to cope with both her injuries and the loss of her dad, and her emotional development comes in fits and starts. I enjoyed the complex directions her thoughts take. She is really just a confused kid suffering through loss, but she really starts thinking about serious issues and complicated facets of life that even adults get caught up in sometimes. I particularly enjoyed how Meri's PTSD progressed. While we only got a few moments with her dad in the beginning, I feel as though Meri (and the readers) come to understand and respect his military service and the trauma that he likely faced as well before being taken too soon by the theater bomber. Bombs Bursting In Air is a scary, yet timely look into an experience that is all too common in our country these days. Lisa A. McCombs does a great job of making the story age appropriate for young adult readers, yet still very real. This book explores one of the most terrifying social issues that we face and this book is a great tool to use in order to talk to your kids and teens about domestic terrorism and gun safety. Bombs Bursting In Air by Lisa A McCombs is a poignant young adult fiction about how faith can help in times of trauma. Meri is at the movies with her father when the building is struck by terrorists. Three bombs detonate and demolish the theater and the patrons inside it. The only reason Meri is alive is because she had been in the bathroom. She had stopped to chat with Fiona, another girl also taking a bathroom break. Because they had stayed to get acquainted, they survived the blasts. After Meri is released from the hospital, the two survivors become close friends. Meri has lost her father, her voice, and her childhood friends have pulled away from her. Fiona, although a few years older than Meri, is helping her learn to cope with her losses and reveals to Meri a different and spiritual side to living. However, there is something strange about Fiona and her unexplained absences and her mysteriously absent twin sister. With the help of Fiona's pastor, the two friends struggle together to overcome the realities of grief and loss and forge a new path to peace and joy. Bombs Bursting In Air by Lisa McCombs is an inspiring tale of two survivors of a terrorist attack. In the beginning, it is heartrending to read the devastation and pain the family felt. Meri's character shows outstanding courage and strength as she confronts the hardship of returning to school, even though her personal life is shattered. Her spiritual growth warms the depths of your heart. Fiona's character is just as admirable. Despite her own tragedy, she manages to inspire and motivate Meri to live again. Their stories give the reader hope that, even when facing the worst possible scenarios, living can be beautiful and happiness does return. This is a beautiful, heartwarming young adult fiction story that exemplifies the power of love and rejuvenation, even in the face of PTSD.